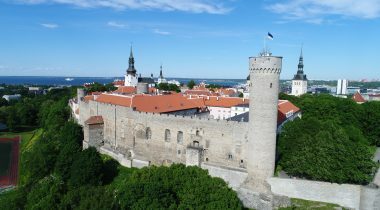 On Sunday, 20 August, Estonia celebrates the Day of Restoration of Independence. On that occasion, all who wish can visit the Tall Hermann Tower and the national flag that symbolises our independence. The Tall Hermann Tower is open to visitors from 11 a.m. to 5 p.m. In order to ensure smooth entrance, visitors will be given free tickets with the time for entrance to the tower. The tickets are distributed until 4 p.m.
On the Day of Restoration of Independence, the August 20 Club will hold its traditional festive meeting in the White Hall of Toompea Castle. President of the Riigikogu Eiki Nestor will deliver the welcoming address to the Club. Member of the August 20 Club Tiit Made will give a speech celebrating the occasion. The August 20 Club, founded in 1994, unites the people who were elected to the Supreme Council of the Republic of Estonia in 1990, and voted for the resolution of the restoration of the independence of Estonia. 26 years ago, on 20 August 1991 at 11.03 p.m., the Supreme Council of the Republic of Estonia adopted the Resolution On the National Independence of Estonia with 69 votes in favour.